The Paris Agreement aims to limit global mean temperature rise this century to well below 2 °C above pre-industrial levels. This target has wide-ranging implications for Europe and its cities, which are the source of substantial greenhouse gas emissions. This paper reports the state of local planning for climate change by collecting and analysing information about local climate mitigation and adaptation plans across 885 urban areas of the EU-28. A typology and framework for analysis was developed that classifies local climate plans in terms of their alignment with spatial (local, national and international) and other climate related policies. Out of eight types of local climate plans identified in total we document three types of stand-alone local climate plans classified as type A1 (autonomously produced plans), A2 (plans produced to comply with national regulations) or A3 (plans developed for international climate networks). There is wide variation among countries in the prevalence of local climate plans, with generally more plans developed by central and northern European cities. 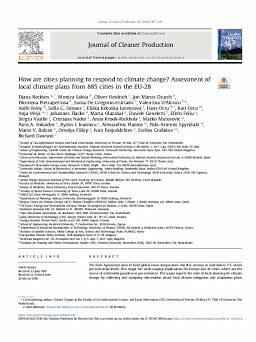 Approximately 66% of EU cities have a type A1, A2, or A3 mitigation plan, 26% an adaptation plan, and 17% a joint adaptation and mitigation plan, while about 33% lack any form of stand-alone local climate plan (i.e. what we classify as A1, A2, A3 plans). Mitigation plans are more numerous than adaptation plans, but planning for mitigation does not always precede planning for adaptation. Our analysis reveals that city size, national legislation, and international networks can influence the development of local climate plans. We found that size does matter as about 80% of the cities with above 500,000 inhabitants have a comprehensive and stand-alone mitigation and/or an adaptation plan (A1). Cities in four countries with national climate legislation (A2), i.e. Denmark, France, Slovakia and the United Kingdom, are nearly twice as likely to produce local mitigation plans, and five times more likely to produce local adaptation plans, compared to cities in countries without such legislation. A1 and A2 mitigation plans are particularly numerous in Denmark, Poland, Germany, and Finland; while A1 and A2 adaptation plans are prevalent in Denmark, Finland, UK and France. The integration of adaptation and mitigation is country-specific and can mainly be observed in two countries where local climate plans are compulsory, i.e. France and the UK. Finally, local climate plans produced for international climate networks (A3) are mostly found in the many countries where autonomous (type A1) plans are less common. This is the most comprehensive analysis of local climate planning to date. The findings are of international importance as they will inform and support decision-making towards climate planning and policy development at national, EU and global level being based on the most comprehensive and up-to-date knowledge of local climate planning available to date.